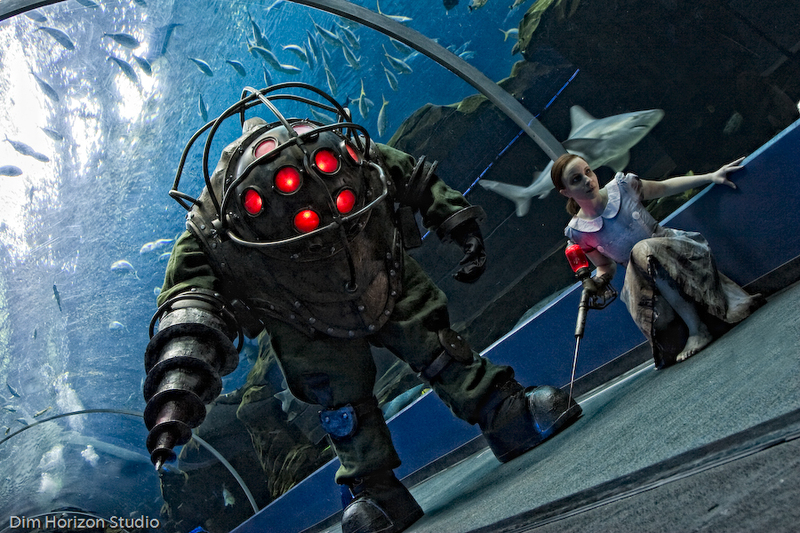 Graphic Artist, Harrison Krix and his fiancée, Emily had a private photoshoot in the Georgia Aquarium showcasing Harrison’s latest work, Big Daddy from the BioShock game. This is a real costume with real LED lights, and Harrison is currently selling it on eBay, open for bidding until December 3, 2009. You could probably win a cosplay competition with this, if he hasn’t already. You can view the rest of the photoshoot in his blog. Great work! Childhood friends Souen Ruka, Ichijou Takuma, and Kuran Kaname are Night Class students of the Cross Academy, and fellow vampires. Ruka is loyal and dedicated to Kaname, even to the point of loving him. Her feelings are left unrequited because Kaname has chosen Yuki to be his lover. After discovering that Yuki is Kaname’s pureblood sister, Ruka comes to accept Yuki and remains dedicated to Kaname in a mature and level-headed attitude. A beautiful, black and white photo of the 3 Night Class students! It’s also a good choice to go for a black and white photo for this series. Great work, Olga! An aristocrat who was brought up as a male in order to succeed her family’s clan, Yagyu Kyubei dresses and acts like a boy but she has not forgotten her feminine self. Because of her upbringing, she was in love with Shimura Tae ("Otae" to most) when they were children. The lost of her left eye was actually a result of Kyubei trying to protect Tae. The incident made Kyubei decide to become stronger. She is now a master of the Yagyu-Ryu sword technique and her strength is just below her grandfather’s. Beautiful cosplay of Kyubei! I haven’t seen Gintama yet, but a lot of people seem to like this series… Maybe I should find the time to watch it. Oh, and this image was first found on Flickr! Thanks Ryan (蒼浩)! Consumed by the darkness provided by Avenger (who was thought to be Angara Mainyu at the time), Dark Saber is the servant of Mato Sakura. Her original Master, Emiya Shiro, later had to make the bitter choice of killing Saber in order to save her from her misery; a fate she gladly accepted. Beautiful costume! I found this on Flickr the other day, and the cosplayer’s name is Calssara there. Most of her photos had descriptions saying the costume is for a German Convention, so maybe she’s German? Either way, she makes a great Saber! Good job! Chrome, or “Nagi” as she is known in her previous life, had an accident while trying to save a cat, leading to the loss of her right eye and some of her internal organs. By a chance of Fate, Rokudo Mokuro finds Chrome while he was taking a stroll in one of his illusions. He creates illusionary organs for her, allowing her to live. I found this cosplay while going through Flickr. 大吉(Agi) is the photographer of this cosplay. Thanks for sharing the photo with us! The Japanese male voice and character of the singing synthesizer application software originally developed by Yamaha Corporation, Kaito is often depicted as Hatsune Miku’s partner. His character has been licensed by a third party known as Crypton Future in Japan. This is 帝, the same person from Flickr who provided C.C. from Code Geass: Lelouch of the Rebellion. Only, this is 帝 herself, cosplaying as Kaito. Thanks for sharing your photo with us!